With more than 30+ combined years in the military promotional marketing industry, Veterans Direct is a leader in the promotional needs of the military, veterans, non-profits and more. Customers include American Airlines, Northrop Grumman, Military.com, Non-Commissioned Officers Association, United States Marine Corps and many more. 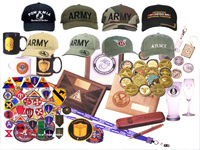 Whether it’s t-shirts, challenge coins, hats, or anything you can put a logo on, it would be difficult to beat our pricing and quality. We do all events including birthday balls. Contact us today for a quote.